Deformation principle studies, development and prototype testing of the EST Crash Buffer, application for patent. Approval tests in accordance with UIC and scale 1:1 vehicle crash tests with loaded freight wagons. 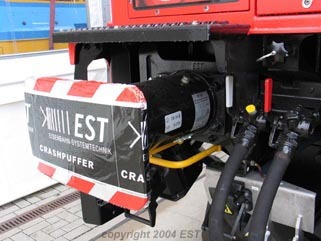 EBA (Federal German railway approval authority) approves the EST Crash Buffer. Public presentation of the EBA-approved EST Crash Buffer in the versions G1-100 (in accordance with UIC 526 for freight wagons and locomotives) and R1-100 (in accordance with UIC 528 for passenger coaches) at the InnoTrans fair in Berlin. Honing of the EST Crash Buffer: introduction of the product generation "-200" with fine-tuned force-deflection characteristics and a service-optimized design. Derivation of the 400 kJ/800 kJ-variant G1-200 K and the diagonal buffer variant X1 of the EST Crash Buffer. Presentation of the EST Crash Buffer at the working group "Tank- und Fahrzeugtechnik" (tank and vehicle design) of BMVBW (Federal German transportation ministery), Bonn. Series production of the EST Crash Buffer G1 begins, with deliveries to Vossloh for the customer SBB. Development of the deformation system EST Duplex G1.A1 consisting of the EST Crash Buffer G1 and the EST Absorber Block A1. Crash testing with DB locomotives in cooperation with DB/Railion Deutschland. Series production of the EST deformation system Duplex G1.A1 begins, with deliveries to Bombardier for the customers SBB (Class Re484) and DB/Railion (Class 185.2, 146.2). Longterm field-testing of the EST Crash Buffer by DB commences with electric locomotives, diesel locomotives and double-decker passenger coaches. Derivation of the R1-200 ST variant with extra-wide buffer plate for Spain (Talgo/Renfe). Approval of SBB Class Re484 (Bombardier TRAXX MS) with the EST deformation system Duplex G1.A1 in Italy. More than 1000 EST Crash Buffers are in service in Germany, Switzerland, Austria, Luxembourg, Belgium, the Netherlands, Denmark, Italy, Spain. Crash testing with passenger coaches of Indian Railways. ÖBB orders the conversion of all Ökombi RoLa passenger coaches with EST crash buffers. Successful completion of the longterm field-testing of the EST Crash Buffer by DB with electric locomotives, diesel locomotives and double-decker passenger coaches after one year. First series deliveries of the EST Crash Buffer G1-200 K in accordance with the dangerous goods transportation guideline (Gefahrgutverordnung) RID 2005 for hazardeous goods tank wagons. Approval of CFL Série 4000 with EST Crash Buffers G1-200 M in France. The EST order book allows to predict that the total number of rail vehicles which are equipped with EST Crash Buffers or Duplex deformation systems will more than double in the course of the year 2006. Up to the beginning of the year 2006, the EST Crash Buffer and Duplex deformation systems have already proven successful in seven real vehicle collisions and severe impacts. In all of these events, the EST deformation systems have proven both the non-triggering of the crash function, where no activation of the crash function was necessary, and the reliable triggering in the case of high collision energies. No damages to the vehicle structures were observed in any of the events. Crash testing with tank wagons in accordance with UIC 573. Classes E 186 111 (TRAXX MS, Angel Trains) 246 001 and (TRAXX P160 DE, LNVG) effectively highlighted Bombardier's rigorous platform and parts sharing concept at the InnoTrans 2006 fair in Berlin, which includes the EST deformation system Duplex G1.A1. 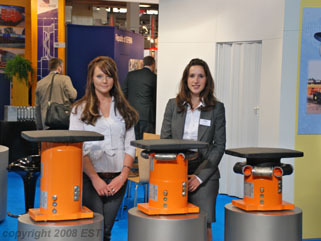 Presentation of the EST deformation system Duplex G2.A2 at the InnoTrans fair in Berlin. The deformation system comprises the EST Supra Buffer G2-100 MC with hydraulically dampened 70 kJ elastic system. Innovation Award of the State of Baden-Württemberg 2006: Dr.-Rudolf-Eberle-Preis. EST is honoured with a special award for its "Energy absorbing, crashworthy railway buffer". With BLS, MRCE and MWB, three private locomotive fleet operators opt for the rigorous retrofit of large parts of their vehicle fleets, as far as not equipped with crash energy absorbers from new, with EST Crash Buffers type G1-200 M. The decision is rewarded with reductions in the annual insurance fees by locomotive insurance companies. 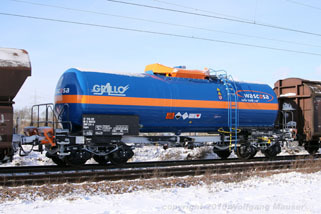 The dangerous goods tank wagon fleet operators WASCOSA and NACCO decide to use the EST Crash Buffers type Typs G1-200 R for retrofit projects and G1-200 K fpr newly built vehicles. The first new-built tank wagons with EST Crash Buffers are granted European approval in accordance with TSI WAG, which has become effective from February 2007 on. Series production of the EST Supra Buffer G2 starts. The buffers type G2-100 MC are delivered to SKODA for the three-system electric locomotive Class 109E and VOITH for the diesel locomotives Class Maxima 40CC and 30CC. Series deliveries of the EST Supra Buffer type G2-100 MB to Bombardier begin. The buffers are used for the TRAXX freight locomotives of RENFE Mercancias (Spain). The final assembly of these locomotives takes place at Bombardier Italia in Vado Ligure, because the capacities of Bombardier in Germany do no longer suffice to meet the great success of the TRAXX locomotive platform family. Series production of the EST Crash Buffer type R1-200 S-IR for Indian Railways starts. In 2007, more than 2000 EST Crash Buffers and Duplex deformation units are produced and supplied. Annual production of the EST Crash Buffer has more than doubled when compared with the year 2006. As one of the biggest European tank wagon leasing companies, GATX opts for EST Crash Buffers in the manufacture of newly built dangerous goods tank wagons, as well as in the retro-fit of existing vehicles. Cargo Rail Service Center (CRSC) includes the EST Crash Buffer in its spare parts programme and reaches an agreement with EST for the provision of a flexible stock, which ensures the CRSC members the ready availability of EST Crash Buffers for accident repair and retrofit campaigns. Polish private railway KM Koleje Mazowieckie orders new double-decker carriages and driving trailers from Bombardier in Görlitz, which are equipped with EST Crash Buffers type R1-200 S.
The private passenger coach operator Wagon Service Travel from Slovakia continues the retrofit campaign of its fleet of vehicles with EST Crash Buffers type R1. At the InnoTrans fair in Berlin, four different locomotive builders present vehicles which use safety components from EST consequently as original manufacturer's equipment: Bombardier (TRAXX lokomotive platform with EST Deformation System Duplex G1.A1), Voith (Maxima lokomotive with EST Deformation System Duplex G2.A2), Skoda (universal high-speed locomotive S 109E with EST Deformation System Duplex G2.A2) and Talgo (variable gauge width high-speed locomotive L-9202 Travca with EST Crash Buffer R1). 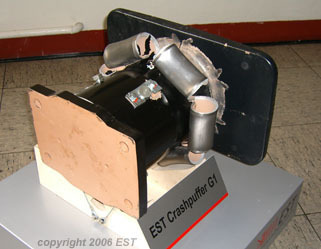 During the course of the year 2009, the total number of EST Crash Buffer and Deformation Systems produced to date rises beyond 10'000 pieces. Hence, the number of rail vehicles that are in service in Europe and worldwide and that are equipped with Crash Buffers or energy absorbers from EST reaches 2500. SBB receives its first vehicles of the new lightweight electric shunting locomotive Class Ee922 from Stadler Winterthur with EST Crash Buffers type G1-200 R.
The Danish State Railway DSM operates new double-decker passenger coaches with EST Crash Buffers type R1-200 S.
EST receives the order to equip the future DB double-decker passenger coaches (called the generation "DoSto 2010") with EST Crash Buffers type R1-200 M. This contract confirms the continuing success of EST Crash Buffers with passenger coaches, too. EST receives important orders from Atir-Rail, Ermewa (Switzerland and France), GATX and Transchem for the retrofit of dangerous goods tank wagons with EST Crash Buffers G1. The first samples in a series of more than 100 Voith Gravita 10 BB locomotives are delivered to DB as the Class 260/261. They are equipped with EST Crash Buffers type G1-200 K.
WASCOSA puts the "Safe Tank Car ®" into service, 80 units of a new hazardous goods tank wagon featuring an especially advanced, innovative safety concept. Amongst others, EST contributes with Supra Buffers type G2, Anti-Climbing Modules type AC04 and Overroll Protection type UE01. At the InnoTrans fair in berlin, EST enjoys unprecedented success. At the fairground, no less than 9 locomotives are shown (from Voith, Bombardier, Skoda, Vossloh and others) that are equipped with EST safety components. gezeigt, welche mit Sicherheitskomponenten von EST ausgestattet sind. After the acquisition of new double-decker carriages and driving trailers from Bombardier in 2008 (which are equipped with EST Crash Buffers type R1) Polish private railway KM Koleje Mazowieckie awarded Bombardier the production of new TRAXX locomotives (which are equipped with EST Deformation Systems type G1.A1) for the push/pull traction of their passenger trainb rakes. Thus, from 2011 on, for the first time, entirely crash-optimized passenger train sets will be operated that are equipped with the safety components from EST. WASCOSA makes its first follow-up order for 37 especially safe tank wagons, which are designed similar to the "Safe Tank Car ®" and equipped with Supra Buffers type G2 and Anti-Climbing Modules type AC04 from EST. ÖBB fits EST Crash Buffers to the headstock of the low-loader wagons for more than 100 RoLa rolling road trains. ARETZ is yet another tank wagon lessor that makes a strategic decision for the EST Crash Buffers. EST celebrates its 10th anniversary. GATX awards EST the largest single order for 1000 pieces of Crash Buffer type G1-200 K in the company history of EST. SKODA starts operating its new EMU type RegioPanter (CD Class 640). This is the first vehicle to use the innovative Anti-Climbing Module AC06 from EST, which forms an integral part of the vehicle crash concept. Voith takes up the series production of the larger Gravita 15 BB locomotive - equipped with EST Crash Buffers. DB is one of the customers. TUVASAS builds new sleeper coaches for Bulgarian State Railway BDZ, which start service in 2013 and are equipped with EST Crash Buffer type R1-200 XS in order to fulfil the European crash standards. 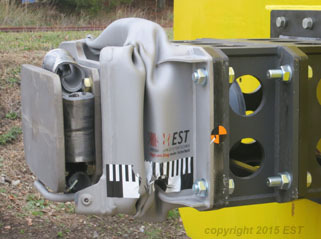 The very first EST Crash Buffers have now been in service for 10 years and have covered in this period distances of around 1 million kilometers on locomotives, or even more on passenger coaches. This is an excellent service life and evidence of extremely low wear and life cycle costing (LCC). Deliveries of the EST Crash Buffers type R1-200 M start for the Bombardier TWINDEXX double-decker coaches generation Do 2010 for DB. In the next years, several hundred of the TWINDEXX coaches will be built for DB. Tatravagonka starts with the production of 450 tank wagons for light and heavy mineral oil, which have been ordered by Swiss tank wagon lessor Wascosa. The wagons are trademarked "Tankcar 3000" and have been conceived especially for a long-term rental contract with a renowned oil company. They are equipped with EST Supra Buffers G2 and Anti-Climbing Modules AC04. The quantity of vehicles is just as impressive as the fact it was the oil company's request that for the very first time, mineral oil tank wagons shall be voluntarily brought to the same accident protection level as hazardeous goods tank wagons, acting by the "Responsible Care" principle. EST wins the order for the crashworthy front end in the TALGO high-speed train for Saudi-Arabia. The vehicles will be built from 2014. For hazardeous goods tank wagons, EST presents the weight-optimized Supra Buffer G2-200 M, which allows to optimize vehicle pay load especially when combined with Anti-Climbing Module AC04. This new crash buffer generation is first used on the Wascosa mineral oil wagons. RBH, a subsidiary of DB, retrofits its fleet of Class 143 locomotives with high-performance buffers, relying upon the well-proven EST Crash Buffers type G1-200 M. Shortly thereafter, DB Schenker started with a similar retrofitting campaign for their Class 185.1 freight locomotives. In the refurbishment of older existing locomotives, Softronic in Romania is integrating the large multi-stage deformation systems type EST Duplex G2.A2. Thus, for the first time, a consequent modernization incorporates the state of the art in vehicle crash safety. The first in the series of these freshened vehicles is presented at the InnoTrans fair 2014 in Berlin. Skoda Transportation in the Czech Republic create the NIM-Express train (N�rnberg-Ingolstadt-M�nchen), a double-decker push-pull passenger train with locomotive and driving trailer for DB. For this interesting project, the vehicle manufacturer once again relies on the safety components from EST. 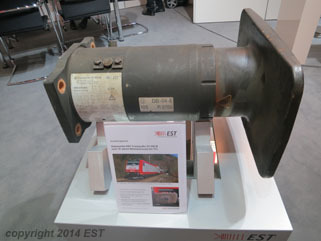 At the InnoTrans fair 2014 in Berlin, EST exhibits a crash buffer G1-200 M which had been in service for 10 years on an electric locomotive in passenger service and travelled more than 1 million kilometers without refurbishment. EST Crash Buffers R1-200 M are known of that have travelled over 2 million kilometers in the same period and keep going. The wagon lessor Aretz, too, is now using EST Supra Buffer G2 in combination with AC04, which is the innovative anti-climbing module according to RID Te25 Section a). Polish company Chemet is the manufacturer of the dangerous goods tank wagons, which have been presented to the public at the 2014 InnoTrans trade fair and the 2015 TransportLogistic fair in Munich. At Harsco Rail in Germany, the first of the SBB maintenance vehicles for the Gotthard and Ceneri base tunnels are taking shape. They are equipped with EST Supra Buffer G2 and Anti-Climbing module AC04, too. With its Duplex Deformation System G2-300.A2-300 EST further expands the product range of high-performance energy absorbing systems for the front ends of locomotives and driving trailers. Company Railadventure of München-Neuhausen extends the use of EST Crash Buffers in order to consequently protect its own vehicles, which are used especially for demanding special services, such as event traffic, transportation and measured test drives. EST Crash Buffers R1-200 M/S for passenger coaches are now also available with a 720 mm wide buffer plate.